Accepts and discharges up to 72 plastic trays containing gum pieces. 304 stainless steel structure, continuous TIG welds, glass bead blasted finish. System includes a custom motorized discharge gate with stainless steel blade and FDA white product contact belt. 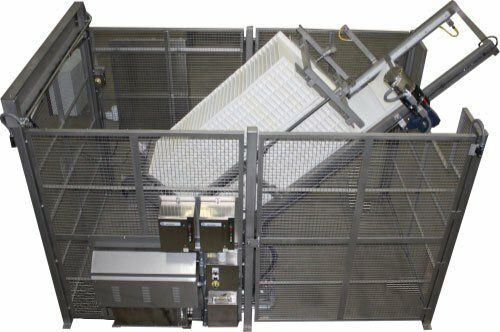 Gate indexes upward, allowing product from (1) row of trays to discharge at a time. Custom hydraulic tray clamping system secures trays prior to tilting. FDA/USDA approved hydraulic fluids and pivot point lubricants. Stainless steel safety caging on four sides, 84” high. Twin access doors on the load side of unit are pneumatically actuated and electrically interlocked. Parker hydraulic pumping unit features 304 stainless steel reservoir and enclosure for easy equipment cleaning. Allen-Bradley PLC Contrologix I/O and PanelView Plus 6 1000 HMI operator interface are programmed for seamless integration with customer’s existing process and control system. Allen-Bradley electricals, and NEMA 4x stainless steel disconnect enclosures.